Happiness, peace and contentment comes from knowing your original documents are safe. 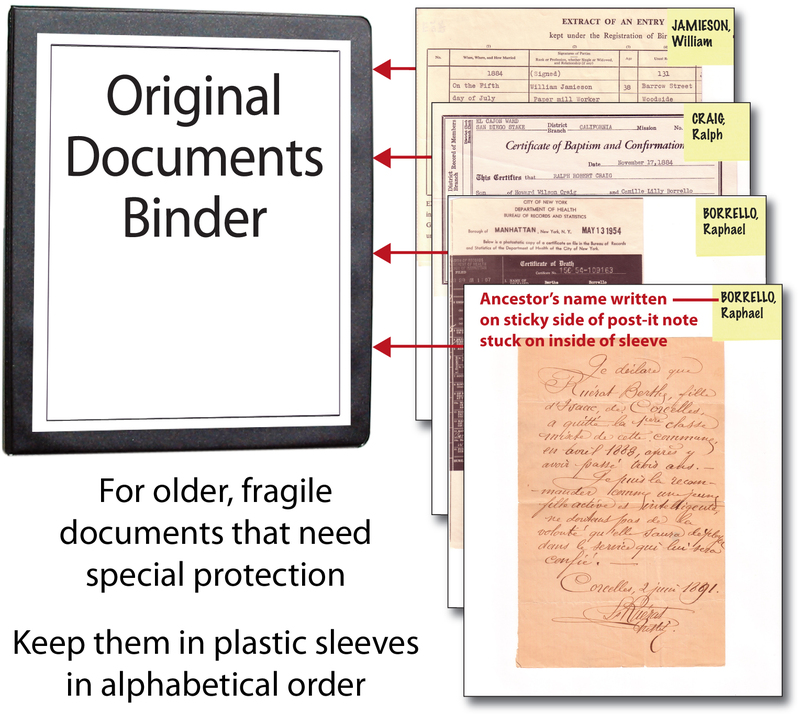 Keep any fragile or special original documents in a sheet protector sleeve in your Original Documents Binder — and place a copy of them in the ancestor’s file folder. As you gather together your family history information (and also during your research) you’ll have or acquire many original, fragile, older documents and photographs that deserve special attention. Instead of just dropping them in a file folder, you might want to protect them by placing them in archival plastic sleeves in a separate binder for safekeeping. Place the copy in the ancestor’s file folder. Write the “Last name, First name” of the husband from the file folder* on the sticky side of a post-it note. Put the original document in a sheet protector. Place the post-it note label sticky-side-facing-up against the plastic sleeve. Place the plastic sleeve in your Original Documents Binder. You can use archival sheet protectors, such as those available from Staples or other office supply outlets. They’re not very expensive. * This keeps all the original documents from that file folder together. If you label using the wife’s maiden and the children’s names, then the documents are scattered all over in your alphabetized binder. But, remember, it’s your family history so you can do it any way you’d like.